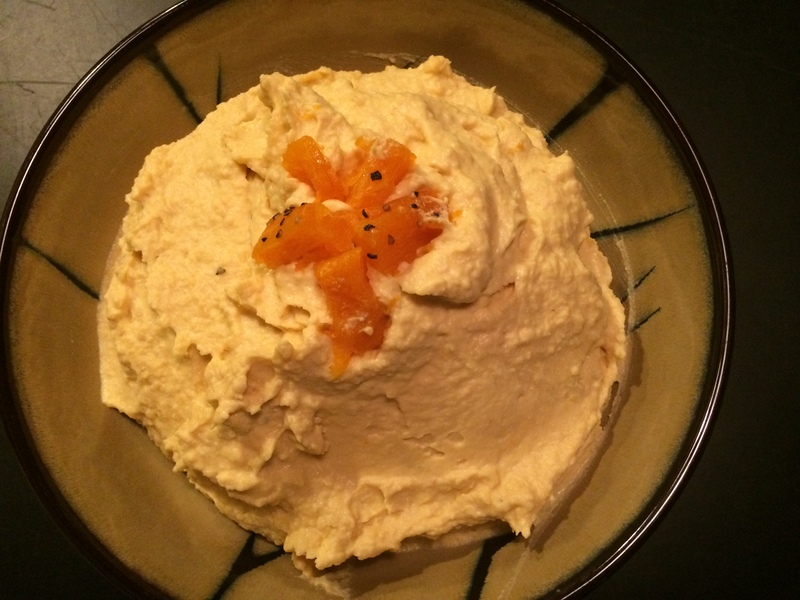 I make hummus all the time because it’s such a healthy and tasty snack and usually I like it in the classic style. Every once in a while I like to mix it up and add some avocado or edamame. Yesterday I had a nice butternut squash and decided to see how it would taste in my hummus. 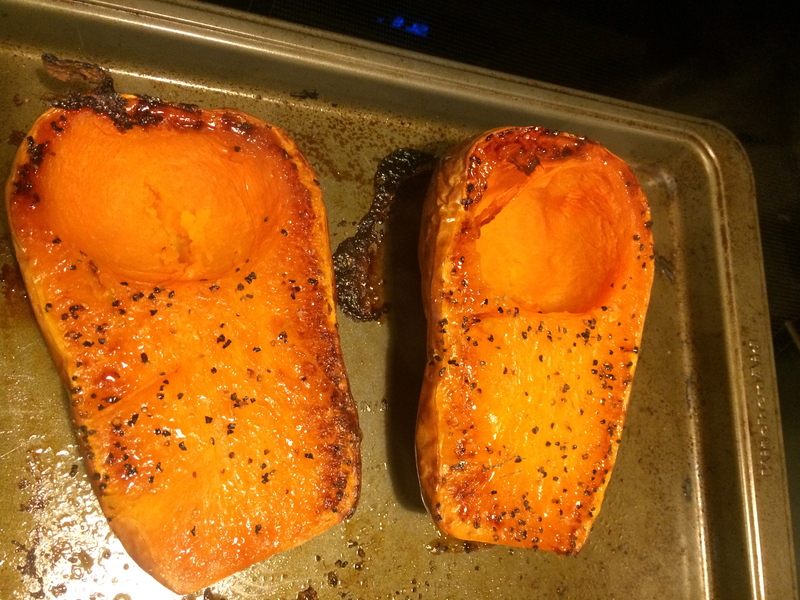 First I roasted the squash cut side down at 450 degrees on an oiled baking tray dusted with salt and pepper. Then I let it cool while I got together the rest of the ingredients. For this batch of hummus I soaked and cooked dried chickpeas, but it’s fine to use canned ones as long as you rinse and drain them. 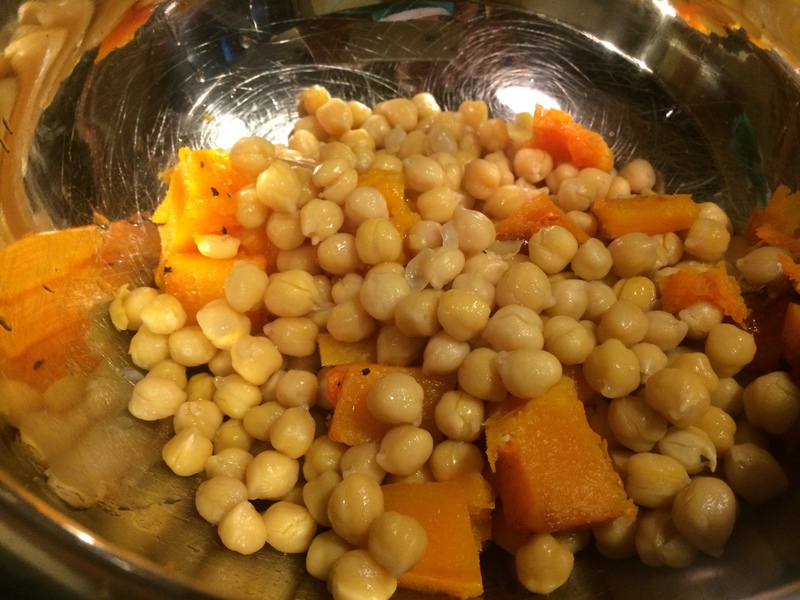 For this recipe I used half of the chickpeas – drained, 3 cloves of garlic, salt, 1/4 cup of tahini, 2 tablespoons olive oil, and the juice of two lemons. I added half of the cooked and cubed squash and using my immersion blender pureed it all. It should be pretty thick and slowly add some of the chickpea water or some warm tap water until it’s still thick but more like a dip consistency. Put all of the ingredients in a large bowl, using only a teaspoon of salt to start. Taste after mixing for salt and add more as needed. Using an immersion blender or a food processor blend until smooth, adding warm water as needed to make the consistency of a dip. You can use chickpea cooking water for extra flavor but don’t use the stuff from the can – it’s way too salty! 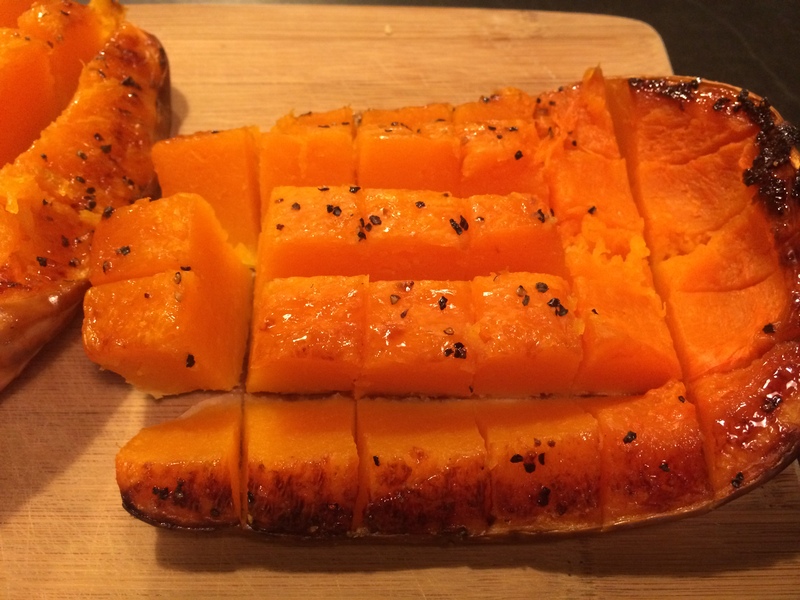 The butternut squash lends the hummus a touch of sweetness but also adds extra vitamin A, E, B6, folate, calcium and magnesium amongst other things. Hummus itself is a super healthy snack with lots of dietary fiber and protein so the two combined are a power duo. I hope you enjoy the recipe and feel inspired to create your own hummus combinations in your own kitchen. Yum! I have tried many variations of hummus and my favorite is roasted red pepper!